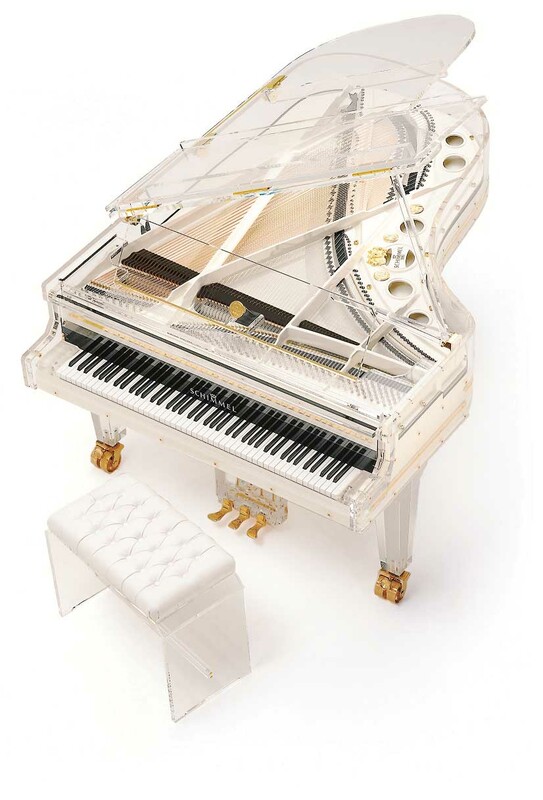 Appearances may lead you to imagine it as a ‘lottery winning’ fantasy grand, but the Schimmel Glass Grand was originally conceived by Nikolaus Schimmel for an exhibition in 1951, as a practical way of showing the inner workings of a piano. Appearances may lead you to imagine it as a ‘lottery winning’ fantasy grand, but the Schimmel Glass Grand was originally conceived by Nikolaus Schimmel for an exhibition in 1951, as a practical way of showing the inner workings of a piano. This remarkable ‘one-off’ piano won so much praise and admiration that it is was eventually turned into a limited production instrument – the factory’s maximum output of this model is 12 pianos per year. As you can imagine this instrument has proven popular with the more showman/rock side of the music business. It has been the piano of choice for artists such as Ray Charles, Lenny Kravitz and Dame Edna Everage. Glass grands may also be found in some of the most exclusive addresses in the world, including super yachts! Three glass grands were once used together for the ‘Oil Barons Ball’ at the Savoy Hotel. Options available on the Schimmel Glass Grand include an internal lighting system and even a self-playing version! If you’re a budding (or professional) rock-star, this is the piano for you. For more conservative tastes, the awardwinning 213 is also available in a traditional case.